This article is about the 30 mm chain gun. It is not to be confused with the Mk44 GAU-17/A, a 7.62mm minigun. 3,000 metres (9,800 ft) land appl. 5,100 metres (16,700 ft) naval appl. The Mk44 Bushmaster II is a 30 mm chain gun manufactured by Alliant Techsystems. It is a derivative of the 25 mm M242 Bushmaster, and uses 70% of the same parts as the M242 while increasing the firepower by as much as 50% with the 20% increase in caliber size. The barrel is chromium-plated for extended life. The gun uses standard GAU-8 Avenger ammunition that is available in API (Armor-Piercing Incendiary), HEI (High-Explosive Incendiary) and APFSDS-T (Armor-Piercing Fin-Stabilized Discarding Sabot-Tracer) variants. The gun can be converted to a caliber of 40x180 mm, which involves changing the barrel and a few key parts, to use the SuperShot 40 cartridge. It can also be converted to use the 30x170 mm RARDEN cartridge. The Bushmaster II is the standard primary armament of Bionix-II AFV currently in service with the Singapore Army, the KTO Rosomak in Polish service as well as that of the CV90 AFVs in Finnish, Norwegian and Swiss service. 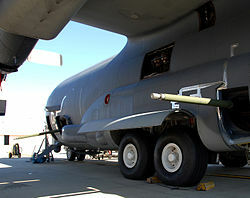 Although the United States Air Force selected this cannon to replace the 25 mm and 40 mm guns on its fleet of AC-130U gunships in 2007, this plan was later canceled. The United States Marine Corps' Expeditionary Fighting Vehicle, which has been canceled, was expected to be armed with this cannon as well. Some United States Navy vessels, such as the new San Antonio-class amphibious transport dock are armed with the Bushmaster II for surface threat defense. The Bushmaster II cannon is used in the DS30M Mark 2 Automated Small Calibre Gun (ASCG) point defense system that is fitted to the Royal Navy's Type 23 frigates. The USAF had experimented with installing Bushmaster II cannons on their AC-130U gunships in place of the GAU-12 and Bofors 40 mm cannons. 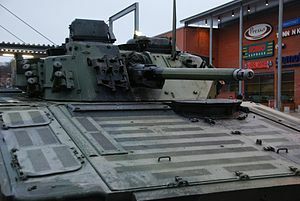 On 11 August 2008, the effort was canceled because of problems with the Bushmaster's accuracy in tests "at the altitude we were employing it." There were also schedule considerations that drove the decision. On 9 July 2012, the Air Force type classified a new version of the Bushmaster called the GAU-23/A. The cannon will be used on the AC-130W and the AC-130J gunships. Mk 46 Mod 2 GWS aboard San Antonio-class amphibious transport ship Green Bay, 2016. The U.S. Navy uses the Mk44 Bushmaster II in the Mk 46 Mod 2 Gun Weapon System (GWS). The GWS is produced by General Dynamics to give warships protection against small, high-speed surface craft. A Mk 46 turret consists of the 30 mm chain gun, a forward looking infrared (FLIR) sensor, a low light television camera, and a laser rangefinder. The guns fire at 200 rounds per minute and are fed by a 400-round magazine through 200-round dual feeds. Effective range is 2,200 yd (2,000 m) for full-caliber high-explosive or armor-piercing ammunition, which can be extended when using sub-caliber rounds. The Mk 46 GWS is permanently installed on the San Antonio-class amphibious transport dock and can be installed on Freedom and Independence-class littoral combat ships as part of the surface warfare (SuW) package. In 2012, the Navy decided to replace the Mk 110 57 mm cannons on Zumwalt-class destroyers with the Mk 46 GWS. Orbital ATK developed a modified version of the Bushmaster II, known as the Mk44 STRETCH, which can fire the 30x173mm Mk310 PABM-T airburst round. The XM813 Bushmaster is based on the Mk44 and is offered as an upgrade for M1126 Stryker and M2 Bradley vehicles, as well as having been a contender to be the primary armament of the GCV Infantry Fighting Vehicle. Improvements include a one-inch longer barrel, integral mount to increase first round hit probability by up to 10 percent, a dual recoil system to enhance accuracy and cope with future hotter propellants, and a Meggitt linkless dual feed ammunition system. The 30 mm chain gun can fire Mk310 Programmable Air Burst Munition rounds to attack targets in defilade. The United States Army Research, Development and Engineering Command helped enhance the XM813 mainly for safety and turret integration. By changing five parts, the gun caliber can be increased to 40 mm. As of November 2013, the XM813 was being tested at Aberdeen Proving Ground over three months to ensure reliability levels of 40,000 mean rounds between failures. Long-term plans are to equip vehicles with the Bushmaster III 35mm/50mm cannon. The XM813 was demonstrated on 10 September 2014 at the ARDEC Digital Multi-Purpose Range Complex. The gun was mounted on a Bradley Fighting Vehicle and fired at targets up to 1,500 metres (0.93 mi) away. An enhanced fire control system improves long-range accuracy to kill targets with fewer bursts, sometimes as few as two or three rounds instead of 10. The XM813 30 mm cannon is intended to replace the M242 Bushmaster 25 mm chain gun, and can be mounted on vehicles other than the Bradley. Two capabilities not demonstrated were its linkless ammunition with airburst capabilities; airburst rounds increase lethality by enabling engagement of targets in defilade when they would otherwise only be suppressed by fire. In early 2015, the U.S. Army approved an upgrade for 81 Stryker vehicles of a Stryker Brigade Combat Team deployed in Europe to be upgunned with the Mk44 30 mm Bushmaster cannon to increase their lethality against other light armored vehicles used by Russia in the theater. The cannons will be installed by 2018, and may be the first step in adding the Bushmaster to the entire active fleet of about 1,000 Strykers; the XM813 variant will be used with the Strykers. The XM813 has a demonstrated firing ability out to 3,000 metres (1.9 mi) for precision firing, nearly twice as far as the M2 .50 caliber machine gun that has a maximum effective range of 1,830 metres (1.14 mi) as an area suppression weapon. The first upgunned Stryker, known as the "Dragoon" for the 2nd Cavalry Regiment the vehicles will be part of, was delivered in October 2016, and the first Infantry Carrier Vehicle - Dragoon (ICVD) was delivered to the 2CR in Germany in December 2017. RCWS-30 mount on Czech Pandur II. AC-130U with a trial installation of two Mk 44 weapons. 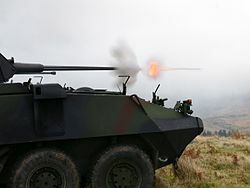 Irish Mowag Piranha shooting Mk44 Bushmaster II. ^ "AIR FORCE CANCELS 30 MM CANNON PROGRAM FOR AC-130U GUNSHIPS - Inside the Air Force, 11 July 2008". Archived from the original on 28 September 2011. ^ Scott, Richard, ASCG enhances Type 23 close-in defence, International Defence Review, 30 October 2007. ^ "Spooky Gun Swap Canceled". Air Force Magazine, October 2008, Volume 91, Number 10, p. 24. ^ "Orbital ATK: Placing its Programmes on Target". Mönch Publishing Group. Retrieved 11 August 2018. ^ "30mm & 20mm x 173mm Munition System". www.orbitalatk.com. Retrieved 19 April 2018. ^ "Orbital ATK rolls out XM813 automatic cannon for US Army Strykers". Jane's 360. Retrieved 11 August 2018. ^ 2CR Receives the First 30mm Stryker in Europe. Defense Visual Information Distribution Service. 8 December 2017. ^ "Blindado Guarani recebe torre dotada de canhão - Forças Terrestres - ForTe". forte.jor.br. 1 July 2011. Retrieved 19 April 2018. ^ Tomkins, Richard (16 March 2017). "Lithuania orders Bushmaster guns from Orbital ATK". United Press International. Archived from the original on 17 March 2017. Retrieved 17 March 2017. ^ Foss, Christopher F (17 March 2017). "Lithuanian Boxers to be armed with 30 mm MK44 cannons". IHS Jane's 360. London. Archived from the original on 17 March 2017. Retrieved 17 March 2017. This page was last edited on 20 January 2019, at 12:44 (UTC).